There have long been unconfirmed reports of Dwarven Senche vamidiums with key parts made of the extremely rare and super-hard Dwarven Adamant metal. At long last, these reports have been substantiated. Adamant Dwarven Senche is an upcoming mount. Its default name is "Chrome Cat". At the Palace of the Mane near Torval, by tradition the Bi-Lunar Guard are all mounted on matching Black Mane Lions, which are reserved for them alone. So be wary if you ride your Black Mane near Torval, lest you anger the Bi-Lunars! 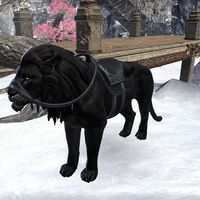 The Black Mane Lion is a mount available in the Storm Atronach Crown Crates as a Legendary-level reward. Its default name is "Nightmane". 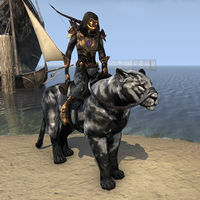 The Black Senche-Lion is the preferred mount of Elsweyr's greatest thieves, who want a ride that's both fierce and can fade into the dark of night. According to legend, the most famous Black Senche-Lion of all was Rajhin's mount Umbrage, which could both talk and, for brief periods, fly! The Black Senche-Lion was available from the Crown Store from April 13, 2017 until April 17, 2017, for 025002,500 . Its default name is "Umbrage Two". A mount said to have been bred by Baandari Pedlars, for ease in leaving town after dark. 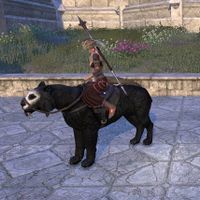 The Black Senche-Panther is a black senche mount previously available from the Crown Store for 025002,500 . Its default name is "Kismet". The Chilling Senche-Lizard is available from Xanmeer Crown Crates as a Radiant Apex-level reward. Its default name is "Frost-on-Scales". A strong yet nimble mount, bred for hunting in the Tenmar forest. 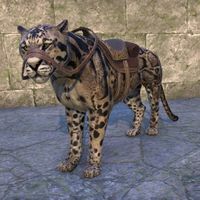 The Clouded Senche-Leopard is a pale brown senche mount previously available from the Crown Store for 025002,500 . Its default name is "Calico". Most inhabitants of Skyrim hate and loathe necromancy, but those Nords who do stoop to raising the dead tend to go all in, wallowing in death and its symbols. It was no doubt such Nord necromancers who bred the skull-faced Death Mask Sabre Cats as mounts. The Death Mask Sabre Cat was available in the Crown Store from October 11 to October 15, 2018. The Dragonscale Barded Senche was available from the Crown Store in the Dragonscale Crown Crates as an Apex-level reward. Its default name is "Clanky-Cat". According to the notebooks of Corvus Direnni, the Frost Senche-Panther may actually be a form of atronach summoned from a plane known as the Fourth Sinus of Takubar. Why it remains in Tamriel where it willingly submits to the orders of mortals is unknown. The Dragonscale Frost Senche was available from the Crown Store in the Dragonscale Crown Crates as a Radiant Apex-level reward. Its default name is "Ice Panther". The Senche-shaped dro-m'Athra are known to the Twilight Cantors as the sar-m'Athra, but everyone else just calls these eerie and uncanny mounts the Dro-m'Athra Senche. The Dro-m'Athra Senche is a black senche with glowing blue eyes and streaks on its body. It appears in a flash of blue smoke when summoned, and leaves behind glowing pawprints and smoke as it runs. It was previously available from the Crown Store for 040004,000 , and can also be found in Dwarven Crown Crates as a Legendary-level reward. Its default name is "Soul-Eater", and it has unique sound effects. 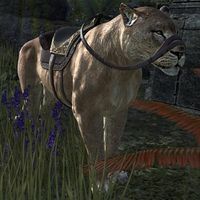 Since nearly all Dwemer sites are in northeast Tamriel, where the only large feline is the sabre cat, scholars of Dwarven civilization have long wondered why they chose to make animunculi mounts that resemble the senche-tigers of the south. It's a mystery! The Dwarven Senche is a Dwarven Automaton-themed mount, or "vamidium". It is available from the Crown Store via Dwarven Crown Crates as an Apex-level reward. Its default name is "Mzan Thunch". Certain rare Dwarven Senche Vamidiums are constructed with key mechanical components forged, not of the usual Dwarven Metal, but of Ebony and Ebony-steel alloys. The Ebon Dwarven Senche Mount is a Dwarven Automaton-themed mount, or "vamidium". It is available from the Crown Store via Dwarven Crown Crates as a hidden Apex-level reward. Its default name is "Chrome Cat". For centuries the conjurers' standard spell for summoning Flame Atronachs has been Koron's Peremptory Summons, which is easily modified to change both the duration of the summoned atronach's binding and its form - for example, into that of a Senche-Tiger. This Flame Atronach-themed senche is available as an Apex-level reward in Flame Atronach crates. Its default name is "Inferno Cat". What were Senche-Tiger Mounts doing in ancient Skyrim, and why were their half-frozen bodies mummified beside the Draugr in certain dark Nord catacombs? And why are they rising now, imbued with animating frost magic? The answers are as yet unknown. The Frost Draugr Senche is an icy skeletal senche available in the Reaper's Harvest Crown Crates as a hidden Apex-level reward. Its default name is "Frostcat Blue". Sabre Cats, of course, are inured to the harsh, wintry conditions of Skyrim, and scarcely need warding from the cold; kitting them out as Frostbane mounts is therefore more a question of tradition than of protection. The Frostbane Sabre Cat was available from the Crown Store in the Scalecaller Crown Crates as an Apex-level reward. Its default name is "Ice Stalker". The Psijic monk who created the spell for conjuring the spirit of a Psijic Senche Exemplar back into the world of the living as a tangible Ghost Cat was a Wood Elf—which probably explains why it manifests as an Y'frren spirit of the Green. 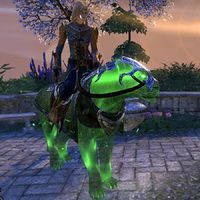 The Green-Graht Ghost Cat is a green ghostly senche available in the Psijic Vault Crown Crates as a hidden Apex-level reward. Its default name is "Jade". 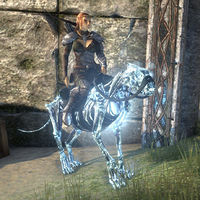 Conventional wisdom holds that these bizarre and eerie Skull mounts are just Senche-Panthers imbued with a haunting illusory appearance—but some whisper that they aren't from Tamriel at all, but summoned from the Hollowjack half-world or demi-plane. The Hollowjack Flame-Skull Senche was available from the Crown Store in the Hollowjack Crown Crates as a Radiant Apex-level reward. Its default name is "Cranium Cat". 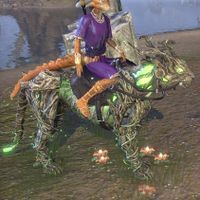 Jaque o' the Hollow haunts Rivenspire during dark Witches Festival nights, and even those who ride Senche-Tiger mounts may find themselves padding headless through the moonless dark while waving a glowing gourd. Hollowjack Rider Senche is a senche mount available from the Crown Store via Hollowjack Crown Crates as Apex-level reward. Its default name is "Decapicat". King of the Nightmare Pride, this night-black senche-tiger has burning paws and flames hissing from its face; rumor says Mehrunes Dagon is responsible. The Manelord Nightmare Senche is the lion version of the Nightmare Senche Mount. It has a flaming mane and tail alongside the features it shares with its panther counterpart. Its default name is "Pride King". The Meridian Sabre Cat is an upcoming mount. Its default name is "Saffron". The Reachmen of the upper Karth valley, who train them as mounts, swear that the Nightfall variant is sacred to the Daedric Prince Nocturnal. 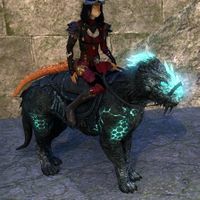 The Nightfall Sabre Cat is a black sabre cat mount. It was available from the Crown Store for 025002,500 between July 6 and July 10 of 2017. It was also available in Xanmeer Crown Crates. Riding Skill does not affect this mount's appearance. Its default name is "Chiaroscuro". 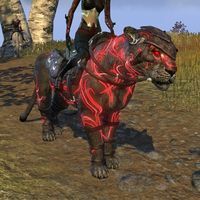 The Nightmare Senche is a black, flaming Senche panther mount that came free with any preorder of the Summerset Chapter. It is similar in appearance to the Nightmare Courser horse. Its default name is "Flame Leaper". The pastoral tribes of northern Anequina need reliable mounts upon which to follow their herds of livestock, and none are more dependable than the prides of Senche-Lions bred near Riverhold, feline steeds so brave and loyal they're called "Noble." The Noble Riverhold Senche-Lion is available as an exclusive ESO Plus Deal From December 20th, 2018 to January 3rd, 2019, and was also available in the Crown Store to all ESO players in January of 2019 for 025002,500 . Its default name is "Pridesteed". The Pride-King Lions are the top predators on the savannahs of northern Elsweyr. No one but the Khajiiti, with their feline intuitions, could have persuaded these proud beasts to serve as mounts. Are you strong-willed enough to control one of these majestic beasts? The Pride-King Lion is a male lion mount. It is available from the Crown Store for 018001,800 . Its default name is "Rory". The Senche Exemplar is the ultimate physical expression of feline grace and power. Khajiiti say it reminds them of the descriptions of Southpaw, the legendary mount of Rajhin the Purring Liar. The Psijic Senche Exemplar is a yellow ghostly senche available in the Psijic Vault Crown Crates as an Apex-level reward. Its default name is "Paragon". The Sabre Cats of northern Tamriel are possibly even more powerful than their southern Senche cousins. They are certainly more feral and difficult to train. That didn't stop the Nords of Falkreath from breaking and training them to serve as mounts! 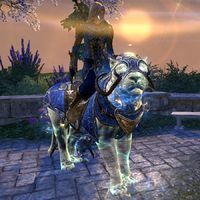 The Sabre Cat Mount was originally available from the Crown Store for 025002,500 . It has pale fur and golden armor. This mount is not affected by Riding Skills visuals, meaning the armor cannot be hidden and there are no upgrades. Its default name is "Fangs". 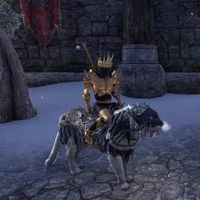 Sabre Cat Frost Atronach is available in the Crown Store as a Crown Gem exclusive for 600 Crown Gems, and is available from December 13th, 2018 to January 2nd, 2019. Its default name is "Icicle Cat". Sapiarchic Senche-Serval is an upcoming mount. Its default name is "Darling". This ominous companion, conjured by Psijic magic in shape of a glowing Senche mount, represents for the monks of Artaeum all of the painful choices they regret having made, but which they nonetheless must ride upon into the future. The Senche of Scarlet Regret is available in the Ouroboros Crates as a Legendary-level reward. This mount has no default name. The cliffs and escarpments of east central Elsweyr are the home of the nimble and sure-footed Senche-Cougars, who prowl the rocks hunting goats and marmots. Inevitably, they've been domesticated by their feline cousins the Khajiit. 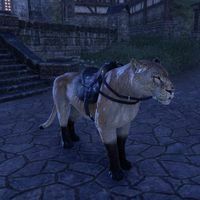 The Senche-Cougar is a senche mount previously available from the Crown Store for 025002,500 . Its default name is "Tawny". A mount bred for bearing an armed warrior while slinking through the steamy jungles of Pellitine. 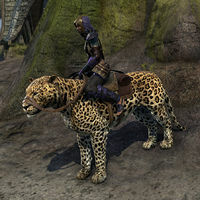 The Senche-Leopard is a spotted golden senche mount previously available from the Crown Store for 025002,500 , or as a Legendary-level reward in Flame Atronach crates. Its default name is "Spangle". These fierce and powerful mounts hail from the broad savannahs of Anequina. 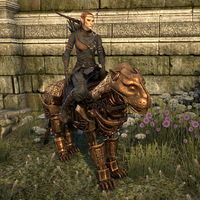 The Senche-Lioness is a golden senche mount available from the Crown Store for 018001,800 . Its default name is "Leola". Senche-Lizard Steed is available from the Xanmeer Crown Crates as a Legendary-level reward. Its default name is "Kitty Lizard". Largest of all the furstocks, or "breeds" of Khajiit, the Senche-raht is fully intelligent, and in combat often serves simultaneously as a warrior and mount. Senche-raht are a breed of khajiit that also serve as a mount. It is available from the Elsweyr Collector's Edition when it is purchased. Its default name is "(?)". Summoned from Oblivion, this shadow atronach was made all the more grand by being compelled to take the form of a senche mount. It's popular amongst those who wish to move quickly and quietly through the more dangerous realms of Tamriel. The Shadow Atronach Senche Mount is a Shadow Atronach horse available in the Flame Atronach Crown Crates as a Radiant Apex-level reward. Its default name is "Shadecaller". 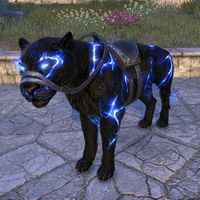 An oversized breed of black senche-panthers, the Shadowghost Senche is said by the Khajiit to be sacred -- or rather unholy -- to Namiira the Great Darkness, who sends them as mounts to bear away those who are doomed to die. The Shadowghost Senche is a black and white senche mount that was available from the Crown Store for 020002,000 for a limited time. Its default name is "Shadowsaddle". Creatures of "Shadow"—are such things possible? 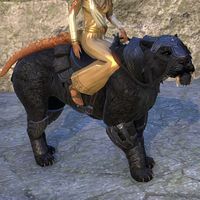 Or is the Shadow-Rider Senche merely a black senche-panther mount wrapped in Illusion spells? Somehow, it just seems too uncanny for that mundane explanation. 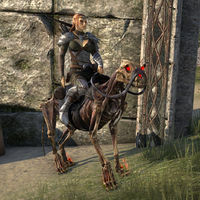 The Shadow-Rider Senche was available from the Crown Store in the Scalecaller Crown Crates as a Radiant Apex-level reward. Its default name is "Gloomcat". The Skeletal Senche may be the most fearsome of all feline mounts. Expertly re-animated, even in undead form it retains all the lithe strength it possessed in life. The Skeletal Senche is available in the Reaper's Harvest Crown Crates as an Apex-level reward. Its default name is "Kittybones". Of all Tamriel's great felines, the Snowy Sabre Cat is the hardiest when it comes to winter weather, barely noticing the Atmoran gales as they come howling in across the Sea of Ghosts. Riding Skill does not affect this mount's appearance. The Snowy Sabre Cat was available in the Crown Store. Its default name is "Ivory". A semi-domesticated version of the wild senche-tiger, this distant relative of the Khajiit has been bred for size and manageability. 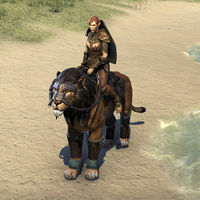 The Striped Senche-Tiger is a striped orange senche mount that was rewarded for 300 days of subscription time as part of the discontinued Loyalty Program. Its default name is "Ratter-do". 'Deep in the shadows of the Tenmar Forest, hidden by its camouflaged coat and stealthy stalking, the Senche-Tiger is a nearly invisible jungle predator. Even as a mount, it retains something of the air of mystery it wears in the wild. 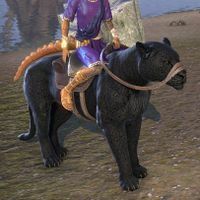 The Tenmar Senche-Tiger is a senche mount that is available from the Crown Store via Dragonscale Crown Crates as an Legendary-level reward. Its default name is "Camo Cat". Vitrine Dwarven Senche is an upcoming mount. Its default name is "Glasscat". 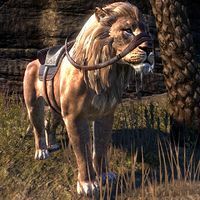 In Elsweyr, the White Lion is considered a highly prestigious mount. When King Keirgo married Queen Eshita, his Orcrest Honor Guard, twenty strong, were all mounted on mature White Lions. The White Lion is an upcoming mount. Its default name is "Custard". The Wild Hunt unravels the shapes Y'ffre established for creatures in the Dawn Era, transforming them into monstrous but vigorous hybrid beasts. Among these, both beautiful and abhorrent, is the Wild Hunt Senche-Mount. The Wild Hunt Senche is available as an Apex-level reward in the Wild Hunt Crown Crate. Its default name is "Twig Tiger". It leaves behind green pawprints, and small flowers briefly bloom where it stands still. This page was last modified on 2 April 2019, at 03:06.